Census, originally uploaded by lightwriter27. This was from an assignment I had for a ribbon cutting at a Census office here in Memphis. The top one was the one that ran in the paper. Recruiting clerk, Betty Moses, works the phones to obtain temporary work positions for volunteers to get ready for the 2010 Census at the Shelby County Local Census Office off of Dexter Road in Cordova where an open house was held to formally kick the Census. 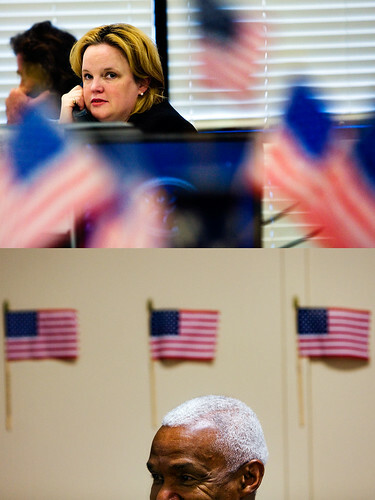 The bottom photo is of the new Memphis Mayor, A.C. Wharton. I posted a photo of A.C. over the summer on my blog with meeting some kids. I got to thinking of that photo during the press conference and thought I would try something again. I was told not to turn in any photos of politicians, but something a little more artistic or, dare I say, abstract. Well, I saw those flags on the back wall and had fun passing the time during the ribbon cutting getting a photo of A.C. with the flags, but not show his full face.